Not many writers would undertake a metafictional mystery novel, and far fewer writers would be able to write a successful one. Anthony Horowitz has nailed the whole metafictional mystery bit with The Word Is Murder. So how does he do it? And what is metafiction anyway? I think of metafiction as a kind of second narrative going on in a piece of fiction, so that the reader has one foot in the fiction and one in the real world. Metafiction draws attention in some way to the artificial construct of a literary work. 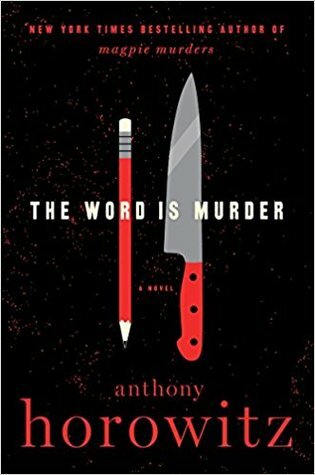 In The Word Is Murder, the fictional first-person narrator is a fellow named Anthony Horowitz, who is remarkably similar to the real-life author Anthony Horowitz. The real-life Anthony has written a trove of mysteries for the BBC (including the exceptionally fine series Foyle's War), as well as the popular Alex Rider series of young-adult books and several standalone mystery novels (see my review of Magpie Murders). The fictional Anthony has these very same writing credentials. Exactly how much the fictional Anthony resembles the actual Anthony in personality is something readers really can't know, but I get the feeling that there is considerable personality overlap between the two Anthonys. When you launch into The Word Is Murder, you aren't quite convinced that you're reading fiction, even though you plucked the book from a fiction shelf at your library. Fictional Anthony is telling you about a murder case in present-day London, against a backdrop of his current writing projects, which you know to be writing projects of the actual Anthony. When fictional Anthony introduces you to a rumpled and idiosyncratic freelance detective named Daniel Hawthorne, you're not sure if Hawthorne is actual, fictional, or a doppelgänger of some kind. In fact, all the characters might be real or might not be. But the murder case is gripping. Diana Cowper is a wealthy London widow, mother of the Hollywood actor Damian Cowper. One spring morning she visits a funeral home to pre-arrange her own funeral. This act is not too unusual; many people choose to spare their families the choices and expense of such arrangements. What is unusual is that Diana is murdered in her home later that same day. The London police detective assigned to the case doesn't think that the two events are connected, but another police official hires Hawthorne to poke around nonetheless. Hawthorne is Sherlockian in his deductive powers and experienced in murder cases from his days in the police force. (He was fired, but that's another story.) Hawthorne persuades the fictional Anthony to accompany him on his investigation, so that fictional Anthony can write a nonfiction "true crime" book about the case. Aside from all the metafictional shenanigans, the mystery itself presents many avenues for inquiry by the detectives. Ten years before her own death, Diana was the driver in a tragic auto accident that killed one child and severely disabled another. Might their family want revenge? Diana’s son, Damian, is a fast-living and egotistical fellow who stands to inherit her estate. Diana has been involved in what may be questionable business investments. Her housekeeper, who discovers her body, seems less than truthful. The red herrings keep multiplying, in a way that keeps you gobbling up those pages. A warning to sensitive readers (like me): There’s one violent scene toward the end of the book, but you can sense it coming and skim over it. Horowitz has written a tour de force in both the metafictional and mystery arenas. I read The Word Is Murder on a long train journey, and it was a good thing that my destination was the last stop, because I would have missed it otherwise! PS—For some non-mystery metafiction, see my review of The Fortunes, by Peter Ho Davies.